Jeff Toister helps customer service teams unlock their hidden potential. He is the best-selling author of The Service Culture Handbook: A Step-by-Step Guide To Getting Your Employees Obsessed with Customer Service. More than 140,000 people on six (6) continents has taken his video base training courses on LinkedIn Learningaka Lynda.com. Jeff’s 15 training videos on LinkedIn Learning include Customer Service Foundations and Leading a Customer Centric Culture. Jeff was named one of the top 30 customer service professionals in the world by Global Gurus. He was also named one of the top 50 Thought Leaders to Follow on Twitter by the International Customer Management Institute. Feedspot has named his Inside Customer Service Blog one of the Top 50 customer service blogs on the planet. Jeff holds a Certified Professional in Learning and Performance (CPLP) certification from The Association for Talent Development. Can you tell us about your journey in writing the book – The Service Culture Handbook: A Step-by-Step Guide to Getting Your Employees Obsessed with Customer Service? What is culture? As entrepreneurs, what are some of the things they should be thinking about? What are some advice you would give to an employee or a business owner who is trying to sustain a service culture and with growth they have not been able to manage the culture with the massive growth that they have experienced? How do they scale but at the same time maintain that same service culture and experience? What is the one online resource, website, tool or app that you absolutely cannot live without in your business? What is one thing in your life right now that you are really excited about – something that you are working on to develop yourself or people? Where can our listeners find your information online? What is one quote or saying that you live by or that inspires you in times of adversity? Jeff Toister stated that what compelled him the spectrum of customer experience was the very first customer he served. He would love to say that it was a success story but it wasn’t, he didn’t do a good job and that changed things for him. He was 16 years old, he was working in a retail clothing store and he had gotten about 15 minutes of training and the person that was supposed to be training him said, “I’m going on break, good luck, here’s the key to the dressing room. Do the best you can, I’ll be back.” He was nervous as young kids often are and I didn’t know what he was supposed to do. A customer comes up to him and he’s just thinking, “Oh no, I don’t know anything” and that’s obviously the wrong mindset but that’s the mind set he had. The customer asked, “Do you carry Dockers?” it’s a brand of khakis and he knew what they were, he had no idea if they carried them or not and so he’s looking around the store and he’s hoping that there’s a big neon sign that says, “Dockers right here” but there was not. And being 16 years old and being inexperienced, the first words that came out of his mouth were, “I don’t know” and without getting a second chance to recover, he got angry and he said, “Wow, this is terrible service” and he stormed out of the store. He knows that that was the wrong answer, the challenge is when you’re employee in that situation how do you stop yourself from giving that wrong answer, that comes with experience, life experience and training knowledge and so in that moment he knew it wasn’t the right answer, he knew he didn’t do well and he never wanted to feel that way again, that was many years ago but throughout his entire career, he has always gravitated towards 2 things: customer service but in particular, What makes employees tick? How do we help our customer service employees perform their very best? And how do we remove these obstacles where we put them in a position where they are not as able to be successful? He has always been fascinated with customer service, he has always been fascinated with training and all of his jobs have focused on that and for the last 12 years he has been a consultant who helps organizations tackle these types of problems. Yanique stated that she finds it interesting that it was a not so positive experience that propelled you into this because as a consultant that many times when a customer becomes loyal to business, if you track back the root cause, it’s usually a dissatisfied customer who dealt with an employee who was able to turn the situation around and just because of how it was handled, now every time they come back to that business they only want to deal with that particular employee, they’ll even wait sometimes if they’re on vacation to come back from vacation to transact business with that company and it all came out of a negative experience. Jeff mentioned the “Peak-End Rule” (Psychology Term), he stated that it explains what Yanique said is true. It’s about customer perception or perception in general that we tend to not notice things that are normal. We tend to notice things that are different than normal and what really stands out is the thing that is most different and so the bad experience if you kind of think of that as the heartbeat of customer service, the bad experience is kind of like this really bad deviation from our normal experience and then a really good correction, really good fix is a huge difference. So, it stands out because it’s such a leap from a horrible experience to this great experience, it becomes imprinted in our memories and that’s the peak part, if it’s the last experience we had with that organization or that person, that really gets imprinted in our memories. So, the Peak End Rule kind of explains why that big gap, it’s so true when we recover from a bad experience, that’s what really sticks in our customers’ mind. 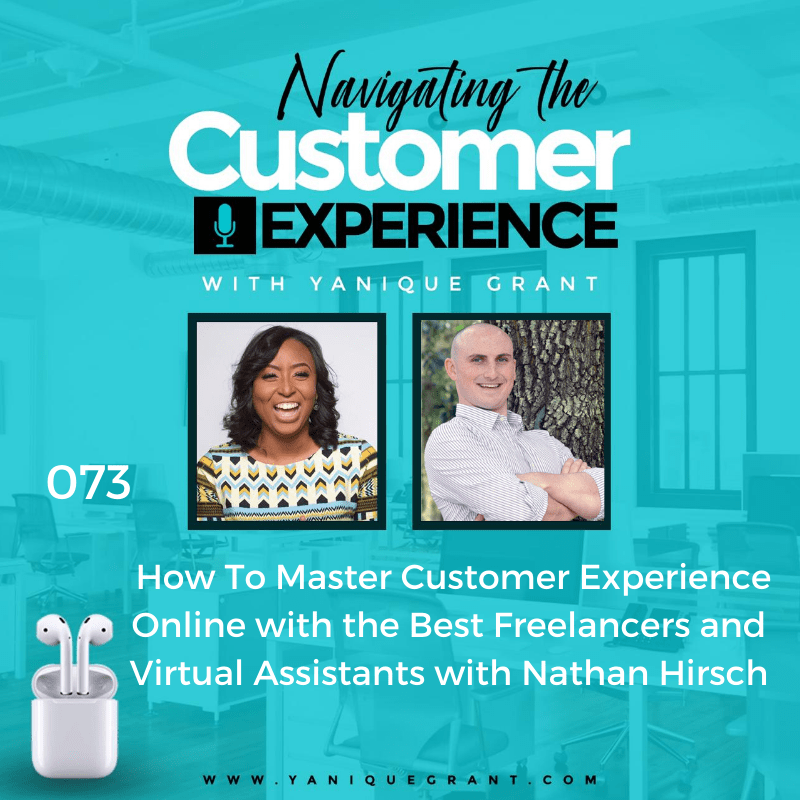 Yanique agreed that he tries to look at a very practical, operational way that any business, even if it’s a small business with just 5 employees would be able to extract that information and run with it in their own company. Jeff stated that even a team because one of the biggest questions he gets is that people say, “I read the book but I’m not the CEO and I don’t even think my CEO cares too much about service, she says it important but I know she really cares about the budget.” And that’s fine, you can still use the book. He has examples in there with specific teams or departments, so whatever the size, whether you’re the CEO or you’re just leading the small team within a bigger company, the goals and the ideas that you can use these tools to create a service culture in whatever you control. Jeff stated that he thinks sometimes culture is one of those words that we take for granted, we all say, “Culture is important” but maybe we mean different things. To him, culture when we’re talking about an organizational perspective, it’s a system of behaviors and beliefs, it’s how a group of people act or thinks and understand the world. Sometimes we think culture is a statement that says, “This is our motto or these are our values” and that’s not quite accurate. Culture is what people actually do, so if people are living those values each and every day then those values are accurate and they reflect your culture, if not, then they’re pretty empty. He gave an example, there was a bank in the United States about a year ago, there was this huge scandal because what they were doing was opening accounts for customers that didn’t request them. Millions of accounts were affected and the reason it was happening is because there were a lot of pressure for the individual employees to meet these very aggressive sales targets, so that’s what led to this huge scandal that the CEO resigned, there was a lot of fines, the Federal Government started to look into it. What was interesting though was that the CEO even in the moment when it was announce that the scandal broke and the CEO still had his job and he was announcing this scandal and this big settlement of a lawsuit, he still pointed to their culture as being customer focused and to him, that’s the perfect example of Your words doesn’t really matter if they’re not backed up by your deeds. How did people actually act? In that organization, the culture was about sales pressure and doing anything at all cost to sell a product. That was their actual culture. So, when you think about organizations and one of the organizations he wrote about in the book is a place call REI, if you love the outdoors, that’s the place to go for your camping equipment, your hiking equipment, bicycling, whatever. REI is an example of culture that really matches what they say. For example, if you go in and you’re looking for camping equipment, you’re not going to have somebody just kind of point you to the camping equipment aisle, the person who works there who’s going to help you is an avid camper, they love camping and they can’t wait to share with you what they know so that you can love camping too and that’s by design because they purposely stated that their goal as an organization is to help us all enjoy the outdoors. That to him is when culture matches what we’re saying, that’s pretty healthy but at the end of the day, culture is what we do, it’s how we perceive the world, it’s what we actually believe. Yanique agreed and stated that in her process of dealing with some businesses this week, she called a company that deals with cooking gas and their office is not located in the city, it’s located on the outskirts of the city so it’s a 20-minute drive and she asked them if didn’t have any other mode of payment because she told the sales representative before they came that she will be paying by card and she specifically requested that the gentleman coming brings the card machine. He comes and he didn’t bring the card machine and of course he now informs her that she needs to drive all the way to the location to make the payment. So, she called them and said, “Can the payment be taken over the phone?” “Oh no, we just changed out our card machines and that’s not possible anymore.” Yanique called and ask them, “Do you expect me to drive 20 minutes outside the city just to get to you to make a payment for a service that you provided, I think you really need to talk to your finance department and think about a more customer friendly way to accept payments from your customers.” And it’s interesting because they were voted one of the best customer service organization in their industry and that left a bad experience. Even when the guys came, the service was good but then the payment part is a part of the service as well. Jeff agreed and stated that whenever that happens, he always wonder why does it happen and is it that the person doesn’t want to do their job, sometimes but often it’s that they are put in that position or no one shared with that driver that Yanique had had that communication or that driver was specifically told, “We’re not doing cards so this is what you have to tell people.” Those employees are often put in a bad position where they almost can’t win. Yanique agreed that with the point that even though they’re not focusing on culture, every organization has a culture but is it the culture that they really want and so if you don’t have intentionally activities, whether it be meetings, conversations, group outings, strategies built around what you’re trying to achieve, then the culture will emerge on its own. And so, you’d have a culture you don’t want all because there was no intentional act but not because you didn’t put any attention there doesn’t mean it’s not formed. Jeff mentioned that often when you don’t put the intention there, it goes in the direction you really don’t want it to go. Yanique mention that the take away from this interview is culture is not something that just doesn’t happen, it happens even without your intentional behavior behind it, it’s going to manifest and this is why you really have to intentionally work towards the culture you want. It’s like eating because we have to eat every day but if we don’t intentionally make an effort to eat healthy then we’ll eat anything and of course the body will just consume whatever you put inside of it and if you’re consuming negative thing then it will lead to disease and chronic illnesses versus taking an intentional approach towards eating, ensuring you do your meal preps, you exercise 3 to 4 times a week, you’re getting 8 to 9 hours of sleep per night, those are things that are intentional activities you schedule into your life to ensure it’s done every single day. Jeff stated that he really likes this question because motivation is a part of something he looks at all the time, not just his own motivation but employee motivation. He thinks we often look at it the wrong way, we look at how we get motivated versus how to not be demotivated and so for him, motivation is easy, he does what he loves. He finds the inner section of what he loves to do and what he can be successful doing and where he has a little bit of skill. Jim Collins’ Good to Great: Why Some Companies Make the Leap and Other’s Don’t’ Built to Last : Successful Habits of Visionary Companies, one of his landmark books. He talked about this head shock concept for companies, it’s an inner section of what you love, what can you do well, what can you get paid to do and he takes that personally. And so, he gets up every day excited because he loves this. The demotivation happens not just for him but for everybody where we perceive that there’s obstacles that stand in the way of doing what we love. In a service environment, referring to his story about his first service encounter, that happens to employees every single day where they want to provide great service, almost every employee wants to provide great service but there’s some obstacle that they perceive is standing in their way and that’s what’s demotivating them. Every day he works on himself but he helps organizations and employees work on finding what are those obstacles and they can remove those obstacles, motivation becomes really natural. Yanique stated that it’s interesting because she does workshops for organizations and a lot of questions that she hears from employees is that sometimes you can’t do what you love because you have bills to pay but then, if you have that kind of mindset which goes back into your attitude. Is it your motivation that affects your attitude or your attitude that affects your motivation? In reference to Yanique’s question if motivation affects attitude or attitude affects motivation. Jeff stated that he is a big sports fan, so the team that’s winning, are they because they are motivator or are they motivated because they are winning. He thinks success breathes that and those two go together. Doing well, we feel good, we’re motivated and if we’re not doing well we feel bad with a bad attitude, we feel demotivated. There’s a concept called, “Learned Helplessness” that a lot of employees’ experience. What it is that over time they feel like they failed trying so they just stop trying. It gets really bad is a lot of times they stay in the same job, not every job is right for every person and so they’ll stay in the job or maybe they have those bills to pay and they don’t feel like they have another good option and so they kind of give up but they keep coming to work everyday and that makes it so much worst because it’s defeating. Jeff stated that the tool that he uses every single day is a website called Highrise, it’s a way of keeping track of clients and projects all in one place. One of his core value is accountability and he believes if you say you’re going to do something, you do it. As an entrepreneur, you have a million things going on and trying to meet deadlines and maintain commitments and do what you say you’re going to do is extremely difficult. So, he uses that through every single day to keep track projects, initiatives, people and making sure he maintains all of his commitments but he also uses it to not just look at an individual commitment but how does that connect to all the other commitments he has made so that he’s not overloading his plate. He uses LinkedIn and Twitter every day as well and primarily to connect with other people and learn from other people and see what other people are doing as he thinks we are definitely in a relationship business. As someone whose passionate about training and adult learning, he’s always learning as well and that’s often where he finds “What are people doing that’s interesting?” So those would he his second and third picks. Jeff shared that he loves to read and is sometimes reading 2 to 3 books at a time. He thought about and said, “What are the books that stick with me?” and that’s the challenge with the book, that we read a book and say, “Oh it’s good” and then you ask, “What have you used from that book?” Jeff shared that these are some book that he uses a lot. One is called Street Smarts by Norm Brodsky and Bo Burlingham and what he loves about it is that it’s an entrepreneurial perspective on the business side of running a business and he thinks in the world of customer service and customer experience, too many of us are unfamiliar or tentative around the business side, the number side. He had a discussion online with someone the other day where they were upset that executives only care about the budget and the point he tried to make and comes from this book is, the way to get executives to care about customer service is you have to translate customer service into numbers because that’s their language and if we’re not doing that or if we don’t know how, we’re only hurting ourselves. The next one is a book called Getting Things Done by David Allen, it’s a system for managing your time and commitments and it’s a principle based system rather than go out and buy this portfolio and you have to use this specific software, it’s more about principles to use whatever you feel comfortable using. He uses those principles to do things that allow him to keep on top of things. For example, at the end of everyday he has zero messages in his email inbox and for most people that’s unbelievable but it’s because he has these set of principles that David Allen shared with him in his book that he uses every day. The third book is a book that really made an impact on him, it’s called Lincoln on Leadership by Donald T. Phillips and what he did was he studied the United States’ 16th president which some people would say would be one of their most amazing leaders in history and he looked at some of the things that Abraham Lincoln did as a leader that we can pull from today. One of his favorite examples that he uses as a consultant and trainer is Lincoln was really the first president to spend a lot of time going to people rather than expecting people to come to him for a meeting or a conversation and the reason he did that, it’s management by walking around which we know now but the idea was, if you approach people in an environment where they feel comfortable and make them feel like we’re on an even keel and you’re not trying to intimidate them then they’re much more likely to open up to you and have an honest and frank conversation and he learned when he’s working with a client and he meets with their front line staff and ask them about their job, they are always ready to tell him exactly what is working well and exactly what they think is going wrong and he thinks it’s because of that principle of coming to them and making them comfortable. Jeff stated he has this thing where he realizes that his audience doesn’t have a lot of budget to spend on customer service maybe technology but not on people. So, one of the things he has been trying to do is transform his own business where he can make resources, tool, concepts available to people at little to no cost and somehow still get paid. A few examples are his book, the investment on the book is USD $14.95 for the paperback or USD $9.99 for the kindle, that’s a pretty low investment yet he puts all the tools he uses as a consultant in that book so you don’t have to hire him because you probably have USD $14.95, you may not have his consultant fee. He has training videos on LinkedIn Learning and Lynda.com and he has learned that a lot of his clients and companies that he works with already has a subscription to one of those platforms, so you can get his training without having to pay for him to come in, the video is right there, it’s available to you and if you don’t have a subscription, it’s fairly inexpensive and then things like this podcast, he loved this opportunity and really appreciate it because it’s a chance for them to have a dialogue about service but it doesn’t cost anything to subscribe to the podcast and learn from it and learn from not just himself but from some of the other amazing experts that Yanique interview. Those are free resources that anybody can take advantage of and he’s really excited about the opportunity to help people wherever they are in their journey. Jeff shared that he’s not a big quote person, the reason he’s not a quote person, the first reason is because he sees quotes and they sound great but then what do we do with them. He’s more of an action person and the second reason is he has done research on some quotes and he has been disappointed to find that that person never said that or that’s not what they meant. He gave an example, the quote, “The customer is always right” no one said that and it bothers him that we have accepted this as some mantra in customer service and he did some research on where did this come from, why do we believe this and there is not really an agreement but it came from a few places. One possible source says Ritz Carlton and he said, “The customer is never wrong” and the context was that even if the customer is wrong, of course they are sometimes, you don’t argue with them, you just find a way for them to help them become right. Marshall Fields who is a famous retailer, he said, “Right or wrong, the customer is always right” and his point was the same thing that the customers will of course make mistakes but we don’t argue with them, our role here is to help them become right, to help them succeed. He wished he had a great quote to share but when he finds those quotes and he found out no one ever said that but the story behind the quote often is much more interesting.